What’s better than a warm chocolate chip cookie? One topped with homemade vanilla bean ice cream, of course. Make this cookie cake if you’re serving a crowd. Mix it up and spread it into a foil pizza pan before your guests arrive. Then pop it into the oven to bake, and let it cool only slightly before slicing and serving. 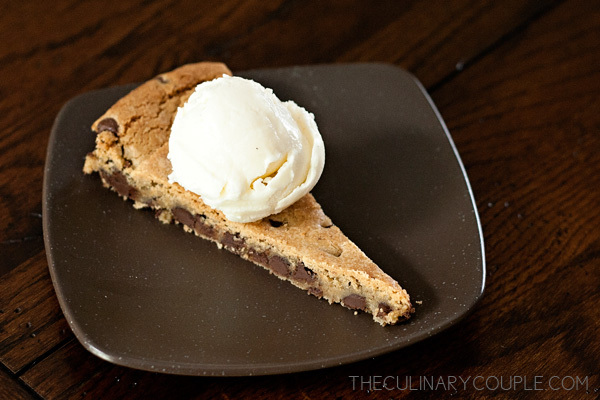 I guarantee you will have no problem finishing this treat before the warm cookie melts the scoop of ice cream on top. Makes one 14-inch cookie cake. In large bowl, beat together butter, granulated sugar, brown sugar, and vanilla until light and fluffy. Add eggs, one at a time, and mix well. Gradually add flour, salt, and baking soda, and beat until well blended. Stir in chocolate chips. Spread into greased 14-inch round pizza pan. Bake at 375°F for 20-25 minutes. Cool in pan, and top with vanilla bean ice cream. Combine 1 cup cream with sugar and salt in a medium saucepan. Scrape seeds from the vanilla bean into the pan and drop in the whole vanilla pod. Heat over medium-high heat, stirring occasionally, until sugar is dissolved. Remove the mixture from heat and stir in remaining 1 cup of cream, milk, and vanilla extract. Cover and refrigerate until mixture is well chilled. Remove vanilla bean before churning. Freeze in an ice cream maker according to the manufacturer’s instructions. I love a good cookie cake! I’ll have to try this one sometime. I don’t have a pizza pan so I usually use a tart pan. Also, I might need to dig our ice cream maker out of storage sometime. Thanks for sharing! Yum…making my mouth water already….glad to see you back blogging again! Hope all is well!